Manchester United winger Jesse Lingard has sent a birthday message to his Red Devils and England team-mate Marcus Rashford on Instagram. 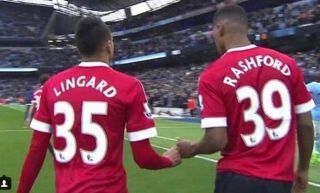 Lingard chose this photo of the pair celebrating together after a famous win away to Manchester City in the 2015/16 season, when Rashford netted a brilliant winner. At the time, the forward was only just breaking into the United team and taking it by storm, though he is now a household name for club and country. We’re not quite sure what Lingard means in his caption as he refers to his colleague as ‘Beanssssss’, but then that’s Lingard for you, isn’t it?